Pathanamthitta district is one the best places in Kerala with lots of Pilgrimages, different types of festivals and beautiful nature with perfect climate for the visitors. It is considered as 'the Headquarters of Pilgrimage Tourism' and always walks with its traditions and culture. Pathanamthitta district, 'the Headquarters of Pilgrimage Tourism' or 'the Abode of God' was established in November-1st-1982 is Kerala's youngest district which borders with 'Tamil Nadu'. This name was introduced due to the large numbers of fully fledged Pilgrims that it receives. It got its name from the words 'pathanam' and 'thitta' which means 'an array of houses on the riverside'. This district covers an area of 2731sq.km with population of 1,231,577 numbers in total by 2001 census having 588,035 males and 643,542 females is the 3rd least populated district. Wayanad and Idukki are on top. About 123,798 of the total population are City men and 1,110,218 are villagers. For every 1000 males there are 1094 females. Malayalam and English are their official languages. Pathanamthitta district is one of the best tourist locations of Kerala and is surrounded by Kollam, Idukki, Kottayam, and Alappuzha. Thiruvalla, Mallapally, Ranni, Kozhenchery and Adoor are its main cities. 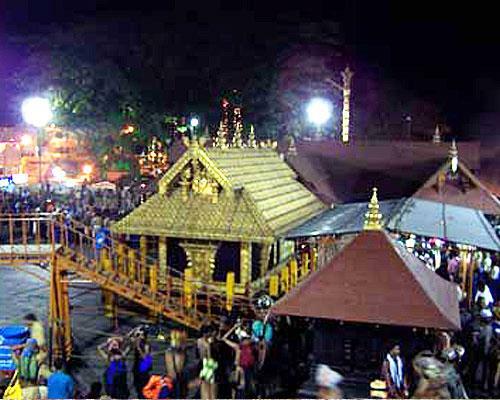 It is famous for its largest pilgrimage center called 'Sabarimala'. The literacy rate of this district is 95.09% and rapid changes were thus seen these days. Cochin Airport has 152km and Trivandrum Airport has 236km from Pathanamthitta. It receives 185cm of rainfall with Tropical climatic conditions ranging between 20-40˚C and is 500-1000m above the sea level. The forest here covers 1551 sq.km of land ie, 58.4% of the entire district. Rubber, paddy, pepper, coconut, banana, ginger, coco, sugarcane and pineapple are the major cultivations of farmers. This beautiful place is completely covered with verities of vegetation and can also be named as 'the Green Land of Kerala'. 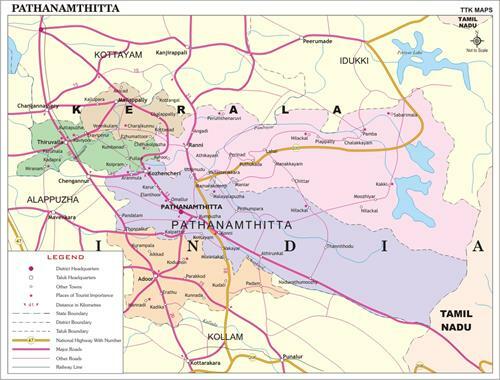 Pathanamthitta came into existence in 1st-November-1982 and was inaugurated in 1st-July-1983. From the past onwards, this place was completely filled with pilgrimage and forest which were famous for its panoramic view, festivals and fairs. At first the district was under the Pandalam reign of the Pandya Kingdom. But by 1820, these places were added to Travancore. The centre of the 'Reunion Movement' was considered as Pathanamthitta in 1930's but the 'Malankara Orthodox church' took a decision to join the 'Catholic Church'. Its major cities Adoor, Kozhencherry, Konni, Ranni, and Pathanamthitta were first a part of Kollam district while Thiruvalla and Mallappally were a part of Alappuzha district. These were then separated and finally making a new district. Pathanamthitta had a major contribution in the freedom struggle. In 1937, Mahatma Gandhi came here and started spreading the message of Charka and Khadi through 'Kadhar Das T.P. Gopala Pillai' who was a follower of Gandhi. In 1941, the 'Mahatma Khadi Ashram' was formed in Elanthoor and in the 'Khadi Movement'; his activity of 'ek paise fund' started emerging for the ordinary people. In 1921 people started to protest against British. But the students strike made in 1921 had uplifted the minds of the freedom fighters. Thus many people were inspired and took the decision to fly the British men away from their native place. Aranmula is a small town nearly 10km on Chengannoor Sabarimala road situated on the banks of Pampa River, famous for its Krishna Temple. 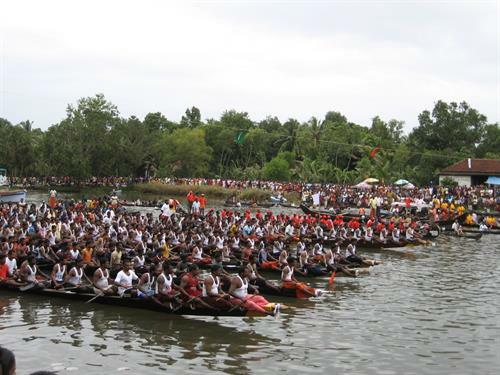 The main attraction for the tourists in this place is the Uthirittathi boat race (Aranmula Vallamkali) during the Onam festival in September or August. The competitions are among its major villages and every village brings their best racers here. The world famous Aranmula Mirror is made here by using a metal which is carved out and polished in a unique fashion. Even though it is costly, people used to buy it for showoff. Being a princely state, Aranmula was owned by the Travancore rulers. 'Aranmula palace' with 200 years of history, 'Aranmula Parthasarathi Temple' which worships Lord Krishna, 'Pulikkunnumala Mahadeva Temple' which was a worshiping place of pandavas, 'Chengannoor Mahadeva Temple', 'Chettikulangara Devi Temple' are some of its famous tourist sites. Maramon is a small town near Kozhencherry and is 10 km away from the headquarters of the district. 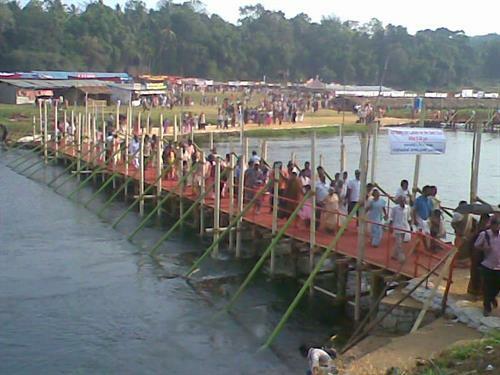 This place is famous for the Maramon Convention; Asia's largest gathering of Christians on the sand bed of river Pampa. It is held in the month of February every year for one week from Sunday to Sunday and is a world famous Convention. The devotion and discipline of the devotees along with the spiritual atmosphere maintained gives us the feeling of heaven. Maramon is considered as the 'birthplace of Marthoma Sabha'. Maramon is famous for an ancient Syrian church with great histories and also famous for a beautiful hill named as 'Charalkunnu'. Charalkunnu is a best place for camping and retreats providing full facilities with an attractive climate. Sabarimala is one of the most popular Hindu Pilgrimage centre about 90kms from Kottayam and is covered with thick forest. This place is famous for its Ayyappa temple and is believed that after killing all the demoness the Hindu God Ayyappan had meditated here. Every year around 50 million devotees visit here by foot without their slippers and shaving, wearing common black dress, and chanting "Saranam Ayyappa" which means "Lord Ayyappa" with a month full long Vritham. The temple is situated at an altitude of 468m on the top of the hill. A huge amount is donated here by the devotees for the sake of their God. During the festival season (Nov/Dec) Tourists and women between age groups 14-40 are not allowed to visit here because Ayyappan is a Bramachari. Only during the Makaravilakku, Mandalapooja and the first 6 days of Malayalam month the temple is kept open for the worshipers. VKV is a popular cultural centre located at Tarayil Mukku junction in Aranmula about 10kms Kozhencherry and started with the aim to improve India's values, tradition, arts, science and to share the great cultures of India among others. It was founded by a French Scholar, Louba Schild offering trainings foe the traditional Arts and crafts of Kerala having great support with UNESCO under the Indo-French cultural exchange programme. They teach India's traditional kalas like Kathakali, Bharatha Natyam, Kuchuppudi, Mohiniyattom, wood carving, Music etc. in order to preserve Indian culture. Sabarigiri project is located about 48kms from Pathanamthitta and is famous for its 'Sabari Giri' which is a large Irrigation and Hydro Electric project. This project was established to irrigate large acres of land and paddy fields by constructing dams across many rivers and the water collected is them passed to a main reservoir in Anamudi and then to Moozhiyar power house using big pipes having covering long distance. Perumhen Aruvi is a small but wonderful sight of waterfalls located 30kms from Pathanamthitta in the Pampa River. Here the water falls to a depth of 100feets and slashes hard on the shaggy rocks and its beautiful scenes have attracted a lot of tourists over the years. Rather than these there are a lot of other places which the tourists would love to visit like Pathanamthitta, Adoor, Erumeli, Nilakal, Pandalam, Cherukolpuzha, Niranam, Konni, Ranni, Thiruvalla and Vadaserikara. The visitors goes back from here with a bunch of good memories.